The plant N acquisition strategy shifts from mainly N resorption at cold and dry biomes to mainly N mineralization at warm and wet biomes. In our recent paper published in Nature Ecology & Evolution, we found that the increase in N resorption efficiency leads to the decrease in litter N mineralization rate. 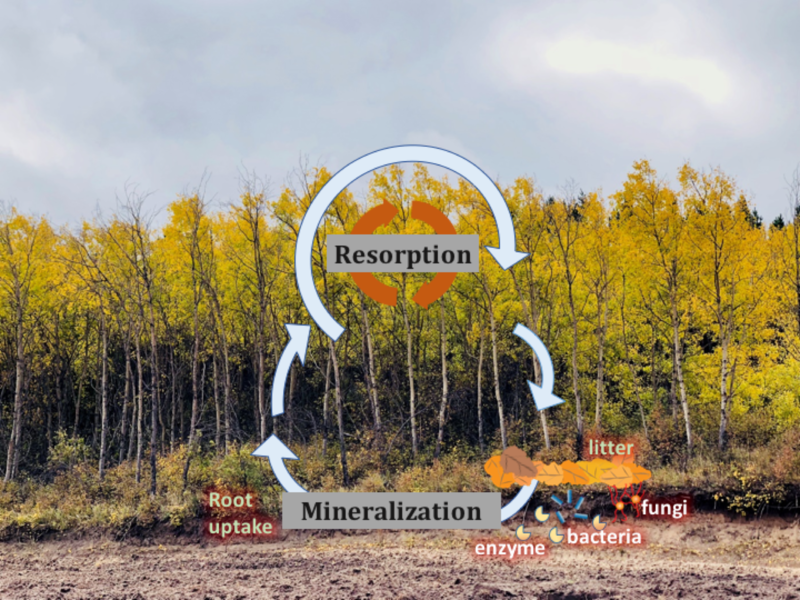 With the increase in temperature and precipitation, the dominating pathways of plant N acquisitions switch from leaf N resorption to N mineralization. Six years ago, I joined the Institute of Botany, Chinese Academy of Sciences and started to set up my own lab. Meifeng, who is the first author of the paper, was among the first graduate students in my group. At that time, I was worried whether I can help them succeed in their probe of their thesis projects. Meifeng and I spent almost one year to discuss her thesis topic. 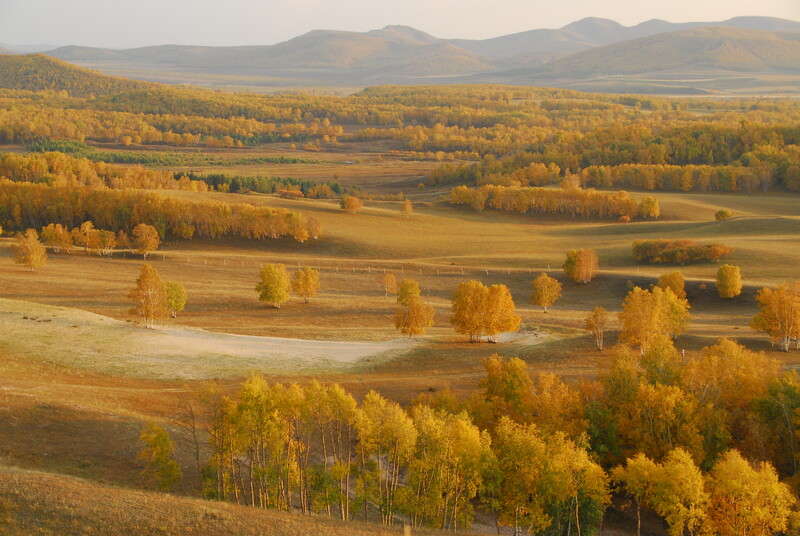 Finally, we decided to explore how nitrogen deposition and stand ages affect plant nutrient uptake and conservation strategies in larch plantations in northern China. It is intuitively obvious that if plants have higher N resorption, the N concentration in their leaf litter will decrease, which may slow down litter decomposition and thus its N mineralization rate. However, when reviewing relevant literatures, I was surprised that there are numerous studies related to N resorption and litter N mineralization, but there lack studies on the interaction of the two processes. I was thinking the biogeographic pattern and the dynamic interaction between N resorption and N mineralization could be characterized if we have sufficient data from different ecosystems. This is not an easy task and requires tedious work of collecting data from the literature. But this will make a nice chapter for Meifeng’s PhD dissertation. Meifeng spent two years to dig data from the sea of literature. When pooling the dataset together, encouraging pattern emerges which confirmed our hypothesis that high N resorption slows down N mineralization during litter decomposition. 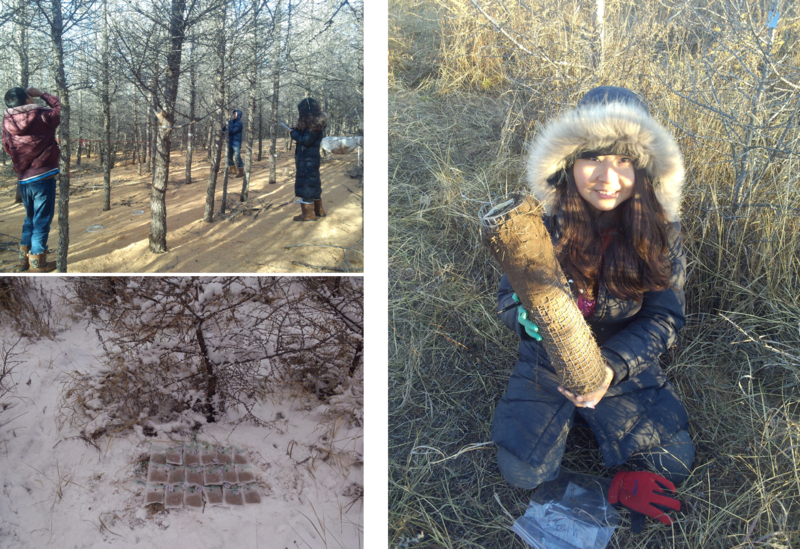 Meanwhile, Meifeng continued her field work at the larch plantations and analyzed microbial enzyme activity and community composition of her soil samples. Her field data revealed that N deposition altered microbial activity and thus organic nutrient mineralization. Then the question arose as how the microbial community interact with N cycle rate across biomes. Meifeng suggested to collect more data to answer this question. We decided to use fungi: bacteria (F:B) ratio as the index for microbial community composition, as previous studies have shown that F:B closely related with N cycling rate. Besides, F:B ratio is widely measured across biomes. With the new dataset, we could explore the geological pattern of F:B ratio, and how F:B ratio could interact with leaf N resorption and litter N mineralization. It was a long journey to compile the dataset, to choose appropriate statistical method and to put the manuscript together. However, this is also a rewarding journey for us. Meifeng’s field experiment and the literature review process strengthen each other. Literature review helped her have a better understanding of the field data. The field work related to N resorption and litter decomposition also helped us better understand the data extracted from the literature. When we submitted the manuscript to Nature Ecology and Evolution in 2017, Meifeng received her first NSF China grant, which supported her to study how biodiversity could affect ecosystem N use efficiency by regulating the interaction between litter decomposition and N resorption. For me, I know more about how to advise students and learn from each other. 1. Vergutz, L., Manzoni, S., Porporato, A., Novais, R. F. & Jackson, R. B. Global resorption efficiencies and concentrations of carbon and nutrients in leaves of terrestrial plants. Ecol. Monographs. 82, 205-220 (2012). 2. Cleveland, C. C. et al. Patterns of new versus recycled primary production in the terrestrial biosphere. Proc. Natl. Acad. Sci. USA 110, 12733-12737 (2013). How do oysters win in the intertidal zone?